Sydney, Australia – 15 May 2018 – VoiceFoundry, a principal provider of enterprise cloud-based contact center solutions with a unique focus on customer experience and automation in North America, today announced that it is expanding services for Amazon Connect to Australian and New Zealand businesses. VoiceFoundry offers a deep legacy of knowledge around Contact Centers, including how they function and operate, and an in-depth understanding of the major technology platforms currently driving Contact Center operations. With over 100+ years of cumulative experience delivering exceptional contact center solutions, VoiceFoundry brings experienced professionals including solutions consultants, application developers, technical architects and AWS certified engineers across North America, UK and APAC. Amazon’s entry into the contact center market has changed the software-as-a-service model completely; no contracts, no minimum commitments – just a simple price per minute for usage. It is set to revolutionize how businesses consume Contact Center and customer experience services and significantly disrupt the traditional players in the Contact Center market. 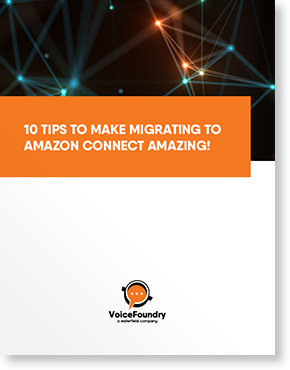 Luke McNamara, VoiceFoundry ANZ Country Manager, said “Amazon’s entry into the Contact Center space is a pivotal moment for the customer experience industry in this region. It is the first Contact Center to deliver on real cloud principles – always on, accessible everywhere, scalable, continuous improvement, APIs and genuine consumption-based pricing”. VoiceFoundry also partners with leading cloud workforce management and optimization platforms and offers standard Amazon connectors for CRM vendors including Zendesk, Salesforce.com., ServiceNow, Microsoft Dynamics and Freshdesk. This is complemented with a full suite of application development, implementation, consulting and managed services to deliver a comprehensive Contact Center solution. Lynn Teague, Director Strategic Accounts, said “We have built a singular focus around Amazon Connect because we believe the Amazon offering to deliver the most robust suite of features and capabilities in the industry. The significant growth we have seen in North America has allowed us to accelerate our plans to move into the ANZ market and we couldn’t be more excited”.